Speaking of gardens, this year's is coming along well, though not without some problems. On the bright side, I have lots of tomatoes, though none are turning red yet. I bought eight plants. I couldn't find an heirloom variety at the time, so I bought a hybrid called Celebrity. I don't can tomatoes, but I do can sauce, so I usually prefer to plant paste tomatoes. I was too late starting my garden to find those, so I chose these, which are producing beautifully. 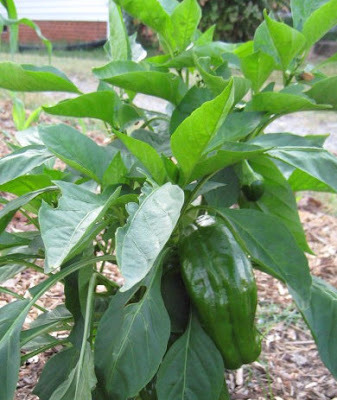 My lone green pepper plant is small, but producing large peppers. It droops during the heat of the day, but bounces back by the next morning. I'm still seeing blossom end rot on the peppers, even though I'm spraying with a calcium solution once a week. I'm also spraying this on the tomatoes, with (thankfully) no signs of problems there. 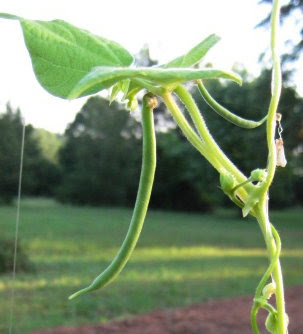 I've got green beans coming along with tons more green bean flowers. The bottom leaves have been looking a bit yellow. Probably nitrogen deficiency, so I sprayed the leaves with a fish emulsion solution. Baby cukes are making an appearance. 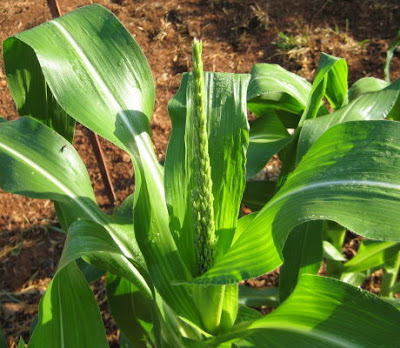 And at about three feet tall, the corn is starting to flower. My okra seems to be taking its time. I wonder if it isn't getting too much shade from the pecan tree next to the garden. 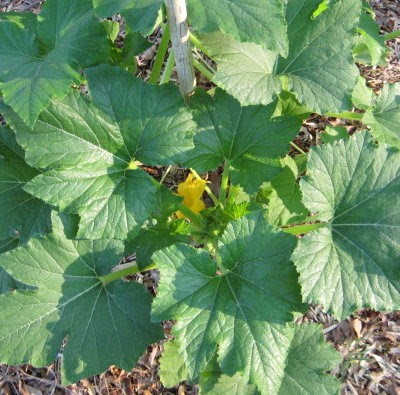 Some plants, like the cucumbers and squash like a little shade. Other plants don't do as well without full sun. Shamefully I have to confess that I'm not sure what this is. 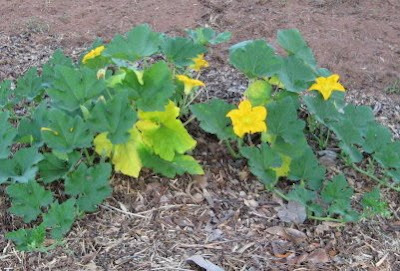 I planted various squashes without writing down what they were. I assumed I'd remember! Big mistake. I know myself well enough to know that I rarely remember things like this because I'm too busy filling my brain with other things. Anyway, it is butternut squash, acorn squash, or straightneck yellow summer squash. Happily, it's doing well and sporting its first flower. 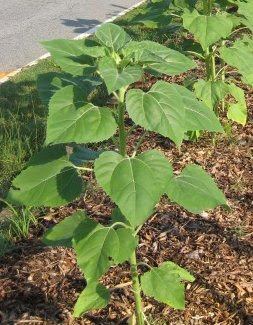 My sunflowers are getting tall and ready to bloom. My pumpkin plants however, which started off with a bang are having problems. Besides the yellow leaves, I've been battling powdery mildew. 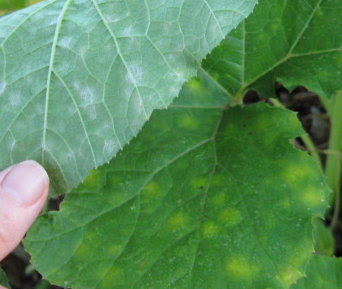 When it first appeared, I started spraying it with a baking soda solution, which is one of the treatments recommended in The Organic Gardener's Handbook of Natural Insect and Disease Control (a great resource.) When it got worse, I switched to a copper based solution. 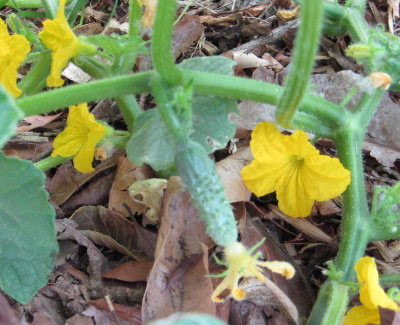 I also started spraying my other cucurbits with it prophylactically. So far, so good! Last week I started fall planting. So far only carrots and a row of broccoli. They haven't come up yet so there's nothing to show you there. More planting to follow soon. Carrots. Mine didn't come up in the spring, so maybe I should try again now? oh your garden looks so yummy to me! a friend of mine told me last year to get my tomatoes to turn red (I had tons of green) to take my shovel or a knife and cut the roots about a foot from the plant. At first I thought she was crazy and only did one plant...but it did work for me. Feel free to look this up before trying though. 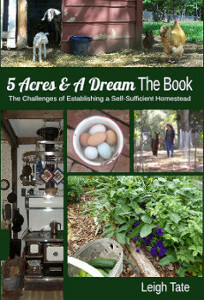 Leigh, Thanks so much for visiting my blog, yours looks like it's full of info, I look forward to reading your posts!!! Looking good!!!! Especially considering you got a late start in a new plot which you nothing about. There's nothing so thoroughly satisfying as watching a garden start to produce. And yours looks like its coming along very well considering the lateness of the planting. Congrats!! My daughter was just saying that there garden is so slow this year. 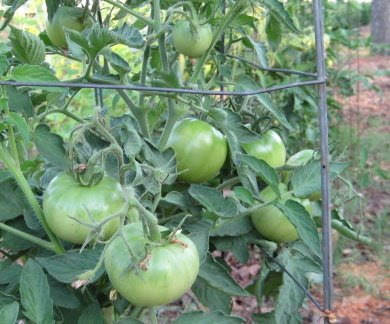 We hope that the tomato's turn red soon! Michelle, yes! Plant those carrots! Renee, that's an interesting idea. I suspect it works because it stresses the plant into hurrying up and producing seed before it dies. I'll have to try it with one of mine, just to see. Julie, I hope so too. I'm not worried though, because I didn't get those plants into the ground until last month. 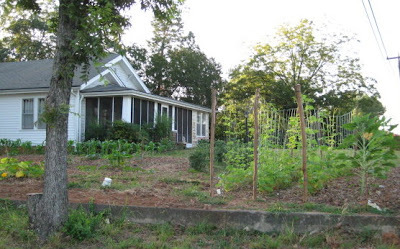 Around here, tomatoes can be planted a lot earlier than that. Maries Cottage, thank you so much for the return visit and kind compliment! Barb, this morning my neighbors were asking me about my "green thumb." I told them I really can't take all the credit, it just sort of turned out this way. Benita, thanks! I agree that this is a satisfying way to spend one's time. 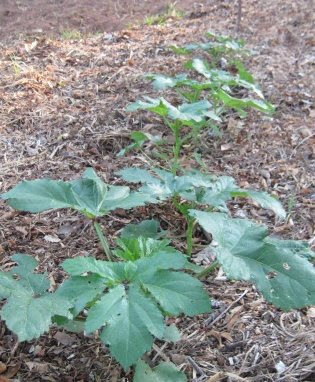 It's got me thinking that next year, I will do a series of plantings for various vegetables. 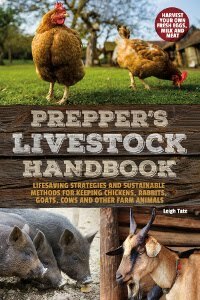 Maybe I can lengthen my growing (and eating) season. Boy Leigh, you guys planted an ambitious garden for staring so late and also doing house renovations. You must have some elves in the woodwork. It was a huge relief to see your tomatoes. Mine look just like yours. That's the one thing I'm crossing my fingers to harvest.